By its very nature, astrobiology is an interdisciplinary field. To the undergraduate coming directly from a background almost exclusively in biology, the sudden influx of planetary science knowledge required can be overwhelming. As a result, a work like Imke de Pater and Jack J. Lissauer’s Planetary Sciences is invaluable. While the incredible number of graphs, charts and formulae filling the book can at first appear daunting, the text is written at an undergraduate level and is easy to understand for those with no formal training in the planetary sciences. Covering an impressively wide range of topics, this book can provide the necessary background detail for understanding any of the factors that may be relevant to your astrobiological research, from planetary composition, to surface radiation, exoplanets and orbital dynamics. This book won’t make you an expert in any area, but it will give you the necessary material to be able to understand how these areas are important for astrobiology, and will give you the grounding needed to be able to read more detailed works. This is not a dedicated astrobiology book. The prospect of life on other worlds is covered in under two pages, focusses primarily on SETI and is written from an astronomy perspective. There is no exploration of habitability of other worlds, save for a brief mention of the Goldilocks zone, but that is not what this book is for. 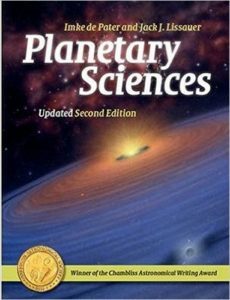 As a reference guide to planetary sciences this book has proven invaluable in helping me get up to speed with the elements of astrobiology that are not biology-focused. I would thoroughly recommend it to any other biologist starting their journey in astrobiology.